The BIBLE stands today the world's Best Seller, and also the world's MOST MISUNDERSTOOD BOOK! The prophecies, especially, are palpably misunderstood. Perhaps unwillingness to accept correction and reproof from the Scriptures is the greatest reason of all. The tendency is to follow tradition, and to read doctrines already accepted and assumed INTO the BOOK, instead of drinking God's meaning out of it. But there is a vital KEY, without which the door to right understanding of the Scriptures cannot be unlocked! The TRUTH ABOUT ISRAEL is this key. Not possessing it, the denominations have stumbled into a maze of traditional error, and today we have a Babylon of contradiction. 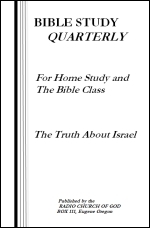 Most people today assume that "The House of ISRAEL" means the JEW. Some teach that Israel now is merely a spiritual term, applying solely to the Church. Others have different ideas. In the lessons that follow will be found an amazing TRUTH, long hidden under the rubbish of tradition and theological bias. It is a veritable "KEY" to Bible understanding. The lessons are thrilling, interesting. This truth will open the floodgates of a joyous new experience that will bring rejoicing to the soul. Study with OPEN mind, carefully, and without prejudice. "Ye shall know the TRUTH, and the TRUTH shall make you free!" 2. Who was it, years later, who said "Lo, we turn to the Gentiles?" Acts 13:46. Was Paul given a special mission, as THE apostle of gentiles? Acts 9:15; Romans 11:13. 3. It is true that when the Jews rejected Jesus, He turned to another people. But strange as it may seem, and as will be proved later, this people was neither Jew nor Gentile! To whom, then, did He turn? Matthew 15:24. 4. Of course nearly everyone supposes that by "The House of Israel" Jesus referred to the Jews. Most people suppose the two terms "ISRAEL" and "JUDAH" are two names for the same people, both meaning "Jew". Are they both the SAME? Hosea 1:6-7, 4:15; Jeremiah 3:11. 5. Do Ezekiel's two sticks represent entirely different nations? Ezekiel 37:15-16. 7. Have they been divided into TWO NATIONS up to, and until the time when God makes them once more ONE NATION? Ezekiel 37:22. 8. Let us see, now, AT WHAT TIME the two nations were again to be made ONE. Note, in verse 21, it is when God takes them from their captivity in the nations where they were scattered and brings them into their own land, PALESTINE, once again. Will it also be when they no longer defile themselves with idolatry, Sabbath — profaning, and all their other sins? Verse 23. Will David (resurrected from the dead) be king over them at that time? Verse 24. When thus united under David as king, will they ever again be driven out of Palestine? Verse 25. Will God make a NEW Covenant with them when they are thus united? Verse 26. Will the Gentile nations know when this happens? Verse 28. (NOTE: Those who deny the truth about Israel claim these two sticks were joined together in the days of Ezra and Nehemiah, when the Jews returned from Babylon, saying the king of Persia was the one king over both nations. The above passages show how absurd and untrue this is. Bear in mind that when David is king once again over all Israel and Judah, that Christ will be KING of kings, and LORD of lords. There will then be kings over each nation, with David king over Israel. Christ will be King over all earth's kings. ). 9. In future lessons we shall see that the children of Israel were divided into two nations; one, with ten tribes, called ISRAEL, the other with two tribes, called Judah. Israel has been called "THE LOST TEN TRIBES." Jesus came to His own, Judah, the Jews. They rejected Him. He turned to ISRAEL, the ten tribes. Is this not brought out by the parable of Luke 19:12-14? Notice, when His citizens, the Jews, rejected Him He turned to HIS TEN SERVANTS! 10. To whom did Jesus command the Twelve Apostles to go with the Gospel? Matthew 10:1, 5, 6. Did He say, "Go NOT to the Gentiles? NOTE: the Jewish historian, Josephus, who lived during the lifetime of Christ, and into the war of 70 A.D., writes that at that time the Ten Tribes of the House of ISRAEL, were completely beyond the Euphrates, and beyond the bounds of the Roman Empire (Antiquities, Book XI, Chapter 5, Sec. 2). He said only the two tribes, Judah and Benjamin, the House of Judah, were then under Roman dominion (Antiquities XI, 5, 2). NOTE: The House of Israel are called "Lost Sheep." They were double lost — lost in identity, supposed to be Gentiles! Lost spiritually, in need of salvation! The original apostles obeyed Christ's commission. After about ten years' ministry around Palestine, preaching to Jews, and especially to those of the tribe of Benjamin, or the Galileans. Peter and the other original apostles journeyed TO CARRY THE GOSPEL TO THE LOST HOUSE OF ISRAEL — the TEN TRIBES — beyond the bounds of the Roman Empire. The identity and location of Ten Tribes was not to be revealed until the "time of the end" — our generation. This is why, after Acts 11, they seem to drop from sight, and we read only of Paul and his co-laborers, sent especially to the Gentiles. 11. But have the ministers, evangelists, and church denominations SINCE Peter's day obeyed the Lord's commission to search out, find the Lost Sheep of the House of Israel, and preach the Gospel to them? Ezekiel 34:1-4. Does the Lord say that He, Himself, will come again to earth, and search, seek, and FIND the lost HOUSE OF ISRAEL, and restore them to their own land? Verse 10-14. This prophesied time, when the Lord shall set His hand again the second time to recover the remnant of Israel (Isaiah 11:11), at His second coming, is now very near. The Times of the Gentiles are about over. The time has come for the blindness of Israel to begin to be removed. The time has come when we can search out, and IDENTIFY, lost ISRAEL! The following lessons unfold the fascinating story, stranger than fiction, from Genesis to Revelation. It is the thrilling story of GOD'S CHOSEN PEOPLE, and the KEY to understanding HIS BOOK, the Bible! 1. Before God made any promises to Abraham, what did He tell Abraham to do? Genesis 12:1. In What sense do we, in order to become His seed through Christ, (Galatians 3:29) have to do the same thing? II Corinthians 6:14, 17. 3. What inheritance did God promise Abraham? Genesis 12:7. Was this land located in heaven, or on the earth? Verse 5, last phrase. 4. Did God repeat this promise of inheritance, and how long was Abraham to possess it? Genesis 13:14-15; Genesis 15:18. Is this same land the saints' eternal home and inheritance through the Gospel? Galatians 3:29; Matthew 5:5. 5. When Abram was 99 years of age, did God propose making a Covenant with him? Genesis 17:1-2. Was this conditional? 7. Were these "many nations" to be the individual Gentiles converted through Christ, or Abraham's racial blood descendants? The answer may be determined by examining whether the rulership over these nations was to be the ONE KING, Christ, or MANY kings of Abraham's blood descent. Verse 6. 9. In the promises to Sarah, do we see GRACE, and the ONE seed, Christ, or fleshly nations and kings? Genesis 17:15-16. 11. While verse 17 refers only to national, fleshly, RACIAL promises, do we not find spiritual promises of GRACE in verse 18? (compare with Galatians 3:8) This is the ONE seed. 13. If these promises of plural seed were of grace, God could not deny any human access to them. Did He not deny all access to them to Ishmael? Genesis 17:18-21. Does not Esau's rejection also prove these promises are of RACE? 14. Since the children of the PROMISE had to come through Isaac and through Jacob, or Israel, can we not see that only national, material promises are referred to in Romans 9:7-14? SUMMARY: The promises were of TWO phases — one pertaining only to RACE, plural seed, national supremacy, called the BIRTHRIGHT, as we shall see later lessons — the other pertaining to GRACE, promising Christ as the culmination of a line of kings, called the SCEPTRE, and giving SALVATION. DEFINITIONS: "Birthright" — Native right or privilege; possessions inherited at birth by eldest son. "Sceptre" — Kingly office; royal power; badge of command or sovereignty. 1. To whom was the Sceptre handed down? Genesis 49:10. 2. Was the Birthright also given to Judah? I Chronicles 5:2. 3. Who was the firstborn of Jacob, or Israel, and why did he not receive the birthright? I Chronicles 5:1. 4. Of which tribe was Christ descended? Hebrews 7:14. Then could the BIRTHRIGHT promise have passed to Christ, and can they be inherited THROUGH Him? Does this not prove these promises were of RACE, not of GRACE? 5. Where was Jacob, or Israel, at the time of his death? Genesis 47:27-29. 6. When it was reported to Joseph his father was dying, whom did he take before Jacob? Genesis 48:1. 7. As Jacob passed the BIRTHRIGHT on to Joseph's sons, does he mention the Sceptre, or kings, or all the earth being blessed through the ONE seed? Genesis 48:2-4. Was possession of the LAND given to Joseph? Verse 4. 9. How did Joseph place his two sons before Jacob, and why? Verse 13. 10. Did the blind Jacob place his hands as Joseph intended? Verse 14. Did Joseph try to correct his father? Verse 17-18. What did Jacob say? Verse 19. 11. Who was to grow into the promised multitude? Verses 15, 16. Then can these promises (the many nations) pertain to "spiritual Israel"? 12. So far, the lads TOGETHER are to grow into the promised multitude. But were they not, later, to become separate? Verse 19. 13. Why does God call Ephraim "My first-born" (as in Jeremiah 31:9)? Verse 20. 14. At what time was Jacob's dying prophecy to be fulfilled? Genesis 49:1. 1. After the death of Jacob, what happened to the little family that survived him? Exodus 1:7-14. 2. How long were the children of Israel in Egypt, before being led out by Moses? Exodus 12:40-41. 3. When they left Egypt, did any of the Egyptians go with them, accepting Israel's God as a result of the plagues? Exodus 12:37-38. NOTE: After formation of the Israelites into a NATION, they were ruled by judges for many generations. Their government was a THEOCRACY, receiving laws direct from God. Each tribe kept separate, occupying separate land; yet like our 48 states, the 12 tribes formed one nation. The Levites were scattered among the other tribes as priests, but Ephraim and Manasseh were each counted as a tribe, so twelve tribes occupied separate territory. All these years, the BIRTHRIGHT continued in Ephraim and Manasseh, and the SCEPTRE in Judah, divided as to tribes, but kept within the one nation. 4. Were the Israelites content to be governed God's way, or did they, like people today, want to be like worldly people around them? I Samuel 8:4, 5. 5. Did Israel have a king before Saul? I Samuel 8:7, 12:12. 6. Was Saul's DYNASTY continued in power? I Samuel 15:17, 23. Why? 7. David was the next king. Was he Saul's son continuing Saul's dynasty? I Samuel 16:1, and verses 11-13. 8. What covenant did God make with David? II Samuel 7:12-16. 9. Was this a CONDITIONAL covenant? Did its continuance depend upon whether Israel or David's kingly descendants sinned? Would the throne cease if they did? II Samuel 7:14-15; Psalm 89:30-36; II Samuel 23:5. 10. Saul's dynasty ceased. (A "dynasty" is a continuous reign passing from father to son.) How about David's dynasty? II Samuel 7:15. How long was the throne to last? Verse 16, Psalm 89:29. 11. Would the sins of the people cause God to break His covenant with David? Psalm 89:34; Jeremiah 33:19-21. 12. Was the covenant, and the throne, established in the days of David and Solomon, or, as some claim, is it to be established, yet future, in Christ at His second coming? II Chronicles 13:5. Does this say "Gave to David," or "WILL GIVE to Christ"? Does it say to David and His ONE Son, Christ, or his SONS? In which son, Solomon or Christ, was the Kingdom established forever? II Samuel 7:12. 13. To how many generations was the throne established from the time of David and Solomon? Psalm 89:3, 4; Jeremiah 33:17. 14. But are not the people saying the Ten Tribes ceased to exist, and that the throne ceased and ended, with Zedekiah? Jeremiah 33:23-24. 15. What is the answer of the LORD to this? Verses 25-26. Does this speak of ONE ruler, Christ, or many? Verse 26. 16. WHY did God make this covenant with David? I Kings 15:5. NOTE: The word translated "seed" in Psalm 89:29, 36, etc., is translated "DYNASTY" in the Moffatt translation. This is its real intended meaning, as David's seed, or sons, continuing his throne, were a dynasty. 17. Was the Sceptre to ever depart from Judah before the second coming of Christ, (Shilo)? Genesis 49:10. QUESTION: We know Christ is to sit upon DAVID'S THRONE, (Luke 1:32) at His Second Coming. How could He sit on a throne that ceased to exist and function 2500 years ago? Unless the throne still continues TODAY, how can He do it? Since the sun and the moon are still in the sky, does not David's throne still exist SOMEWHERE? 1. After David's death, who succeeded to his throne? I Kings 2:10-12. 2. Solomon taxed the people excessively, reigned in gorgeous splendor, married Gentile wives, sacrificed to their idols, and committed other sins. In consequence, what did God say to him? I Kings 11:11. Did God say He would take away a few tribes from Solomon's throne, or was it the kingdom, or nation itself that was to be rent? 3. Was it to be taken away during Solomon's lifetime? Verse 12. Why? 4. How much was to remain for Solomon's son, Rehoboam, to reign over — the NATION, or a tribe? Verse 13. Why? Will this keep David's dynasty alive, as God had promised in the Davidic Covenant? 5. Who succeeded Solomon to the throne of David? I Kings 11:43. 6. What proposition did the House of Israel make to King Rehoboam, through their spokesman Jeroboam (tribe of Ephraim)? I Kings 12:1-4. 7. After consulting both the old men and the young men, how did Rehoboam reply? Verses 13-14. 8. Then what did the nation ISRAEL do? Verse 19. 9. Who was now the king of Israel? Verse 20. 10. Notice, Jeroboam is now king over "ALL ISRAEL." How many tribes were left under reign of David's throne now occupied by Rehoboam? Verse 20 (last part) and 21. By what name were these two tribes called? Verse 21. It is vital to notice, and remember, the name ISRAEL continues with the ten tribes, and David's throne now rules over, merely, the HOUSE OF JUDAH. Thus the twelve tribes of Israel are now divided into TWO NATIONS, called by different names, ruled by different kings. Now, for the first time, the BIRTHRIGHT is in one nation, ISRAEL, headed by the tribe of Ephraim, and the SCEPTRE is in a different nation, JUDAH. Truly, Israel's name is now named on the descendants of Ephraim and Manasseh, as prophesied in Genesis 48:16. From here on, those of the tribe of Judah are NOT called "ISRAEL," but "Judah." 11. Jerusalem, of course, remained the capitol city of JUDAH, where David's dynasty continued. What city became the capital of ISRAEL? I Kings 16:29. 12. The term "JEW" is merely a nickname for JUDAH. It was never applied to ISRAEL, but only to JUDAH. Thus the JEWS are not the House of Israel, and prophecies pertaining to ISRAEL never apply to the Jews. The first place in the Bible where the word "JEW" is used is II Kings 16:6. Begin reading from verse 1. Note, Rezin, the ally in the war with ISRAEL, fighting against Judah, "drave the JEWS out of the town of Elath." Here ISRAEL is at war against THE JEWS! The term "JEW" does not appear again in the Bible until Israel had been driven out and lost, and in EVERY place it is used in the Bible, "JEW" applies to those of JUDAH only! 1. After Israel and Judah became separated into two nations, what was the first act of Jeroboam, king of Israel? I Kings 12:28, 29. 2. During the succeeding reigns of the 19 kings of Israel, divided into 7 dynasties, did the House of Israel depart from this sin of Jeroboam? II Kings 17:22, 23; Ezekiel 20:10-14. 4. When this penalty was imposed, and Israel was taken a captive people, were they taken to Babylon, as were the Jews 131 years later? II Kings 18:11. WHY? Verse 12. 5. After Israel was taken to Assyria, how many of the tribes were left? II Kings 17:18. 6. Israel now begins to dwell "many days without a king." Did God still have mercy upon Israel? Hosea 1:2-6. 7. How about David's throne? Did God break His promise to David? Verse 7. 8. Why have they become known as the "LOST Ten Tribes," while some say they have ceased to exist? Deuteronomy 32:26. Could this text apply to the JEWS? 9. Did God hide even HIS face from Israel, so they were lost from Him? Isaiah 8:17. 10. Was even their language to change? Isaiah 28:11. 11. Does the above verse apply to modern "tongue speaking," or to reading the Bible, translated into a language different then the Hebrew? Verses 9-11, 13. 12. Was Israel finally to become a righteous nation? Were they to lose their name Israel, and be called by a new name? Isaiah 62:2. 14. Was Israel's way ever hid from the Lord? Isaiah 40:27. 15. When Israel left Assyria, was she to find her path, or way, or to become LOST? Hosea 2:6. 16. They knew the land of Assyria. Were they to go from there to an unknown homeland? Jeremiah 16:13. 17. Though Israel was sent into 2520 years of punishment, were they yet to become numerous? Hosea 1:8-10, first part. 18. In the faraway strange land where they would be called Gentiles, were they final to become identified as God's covenant people, Israel? Verse 10, last part. 19. In these very last days, when they once more become known and identified, what will they do? Verse 11. We come today to a most important and fascinating phase of this study — a veritable connecting link between history and prophecy — as little known as any truth in the Bible. Today we skip 131 years, from the time of Israel's captivity to Assyria. 2. Jeremiah, when a lad 17 years old, was commissioned to do TWO things. One was to act as intermediary, or God's agent, in tearing down the throne of David. What was the other? Jeremiah 1:10. 3. What he tore down was the throne of David. What was he commissioned to build and to plant? Was it not the same throne? 4. In his early years, Jeremiah, as God's prophet warned Judah of her impending destruction unless she repented. It was when he had become a white-haired patriarch, in the reign of King Zedekiah, that the first half of his commission was performed. When the Jews were taken captive, how many of the king's sons were left to continue David's dynasty? How many of the nobles of Judah? Jeremiah 39:1-7. 5. Was King Zedekiah killed also? Jeremiah 52:10-11. 6. Was King Zedekiah related to Jeremiah? Verse 1 (Jeremiah 52). 7. After the Captivity, was Jeremiah given any special privileges, and liberty to make possible the performing of the second half of his commission? Jeremiah 39:11-12. 8. What did the captain of the guard say to Jeremiah? Jeremiah 40:2, 4-5. 9. Where did Jeremiah go? Verse 6. WHY? 10. Ishmael treacherously killed Gedaliah and took the Jewish colony captive. But Johanan recovered the captives, and planned to flee to Egypt. He asked Jeremiah to ask God about it. What was Jeremiah's answer? Jeremiah 42:7-16. 11. How did Johanan reply? Jeremiah 43:2,4. 12. Besides Jeremiah and his scribe, Baruch, was any royal seed taken to Egypt, which was material for the planting and building of David's Throne? Verse 5-7. 13. Was Baruch's life under divine protection? Jeremiah 45:2-5. 14. The king's daughters was Jeremiah's great-granddaughters. Were they also under divine protection? Jeremiah 15:11, 14. 15. Did they escape from Egypt? Jeremiah 44:12-14. 16. Where did they go? Verse 28. 17. And then where? Isaiah 37:32, 31. Before proceeding with the story-thread, let us consider a "breach" that occurred in the days of Judah, son of Jacob, and the father of the kingly line of the Sceptre promise. Read, alternately in unison, Genesis 38:24-30. Note marginal renderings. There would be no object in this incident being recorded in the Scripture, unless the breach did occur later, and a descendant of Zarah finally got the throne. But David, Zedekiah, and Christ, were all of Pharez line, according to Luke's genealogy of Christ. So the scepter was never transferred before Zedekiah. It had to occur after Zedekiah's death. And since David's dynasty can never cease, because of God's promise, the only way it could occur would be through a marriage of a SON of Zarah with a daughter of Pharez and David and Zedekiah. If ever it occurred it must have been at the time of the overturn of the throne under Jeremiah. 1. Who was the wicked prince, of the kingly tribe of the children on Israel? Ezekiel 21:25. (King Zedekiah). 2. If the one called "high" (Zedekiah) is to be abased by losing the crown, and another who had been "low" was now to be exalted by having it, would the throne cease to exist? Verse 26. 3. How many times was the throne to be overturned? Verse 27. Could this be possible if it ceased to exist at the 1st overturning? What is to be no more, the throne, or the overturning, then? Jeremiah performed the first overturn. Two more were to follow later, after which it would no more be overturned until Christ comes to take over the throne eternally. 4. Who was the great eagle? What was Lebanon? What was the highest branch of the Cedar? Ezekiel 17:3. Interpretation from Verse 12. (Jehoiachin, not Zedekiah). 5. Who took OF the highest branch of the Cedar? Verse 22, first part. 6. Since this highest branch is the King of Judah, what would a twig OF this branch be? Same verse. 7. Would a TENDER one of his young twigs be a boy, a girl? Where was it to be PLANTED? Same verse, last part. 8. Does this prophecy tell us WHERE Jeremiah went with the king's daughter to PLANT the throne he had torn down? Verse 23, first part. 9. Is this tender branch to grow and become a Cedar? How great shall it become? Verse 23, last part. 10. Judah has been the "high tree." Who, then, is the "low tree" that is now exalted at this first "overturn" of the throne of David? Verse 24. 11. Then does not this parable tell us that Jeremiah took the king's daughter to the Lost House of Israel, and there planted the throne of David, by a marriage between a daughter of Zedekiah (Pharez) and a son of Zarah? NOTE: We have seen how Jeremiah, accomplishing the overthrow of David's throne, took a daughter of King Zedekiah of Judah to the Lost House of Israel, and there planted the throne of David anew. We are now ready to search out the actual location and identity of the Lost House of Israel. 1. At what time did Amos write his prophecy? Amos 1:1. Whom does his prophecy concern, Israel, or the Jews? 4. While David was king IN JERUSALEM, what did God say He would do with the House of Israel? II Samuel 7:10. 5. So Israel was to be PLANTED in another land and to move no more during this age, but were they not to become COLONIZING people, spreading out FROM this place, to the east, north, south, and west — all over the earth? Genesis 49:22; 28:14. NOTE: Since Israel was never to move FROM this place where planted, and yet was to colonize and spread all over the earth, their headquarters, where the THRONE was planted, could not move. So, it's location TODAY must be the same as its general location when Jeremiah planted the throne there. Therefore the prophecies telling where the House of Israel finally migrate FROM, at the coming exodus at the end of the age, tell where Jeremiah went. The two succeeding "overturns" of the throne must not involve a change of location in general. 6. After being carried to Assyria, which way did Ephraim go? Hosea 12:1. 7. Where is a message sent to Israel? Jeremiah 3:11-12. 8. Where will they come FROM, at the great forthcoming exodus? Jeremiah 3:18. Also Hosea 11:8-10. Also Jeremiah 31:8. 9. Where does Isaiah say they will come from: Isaiah 49:3, 6, 12. NOTE: In the Hebrew there is no term for "northwest," but it is expressed "north and west." Thus some texts say from the west, some from the north, and it was from the NORTHWEST of Jerusalem, Vulgate translates "Sinim" as "Australia". 10. Where did God say He would "set" or plant David's throne? Psalm 89:25. 11. Where does Isaiah locate Israel? Isaiah 49:1. 12. How and where does Jeremiah identify and locate Israel? Jeremiah 31:6, 7, 10. Also Isaiah 51:4, 5. Also Isaiah 42:3-4, 10, 12. NOTE: The location, therefore, is northwest of Jerusalem, in the Isles, in the Sea, now the chief of nations — Great Britain! She fulfills every prophecy! The British Isles are due northwest of Jerusalem. 2. Was Israel to lose her name? Isaiah 62:2. 3. What was the name which the mouth of the Lord named, by which they should be called? Romans 9:7. 4. Were they ever called by the name of Isaac? Amos 7:16. 5. Did God cause the House of Israel to set up "waymarks" or signs, along the trail from Assyria to the British Isles, so they could finally be traced and identified? Jeremiah 31:20-21. 7. When the tribe of Dan captured Laish, how did they leave their "serpent's trail"? Judges 18:26-29. 8. When the Danites captured Kirjathjearim did they place the name Dan in it? Judges 18:11-12. NOTE: Thus we see that the Tribe of Dan left their "serpent's trail" wherever they went, by placing the name of Dan their father into every place where they went. Since the vowels were never used in Hebrew spelling, Dan was written "Dn." Therefore, supplying the vowel in pronouncing, it might be pronounced "Dan," or "Den," or "Din," or "Don," or "Dun." Half the tribe of Dan lived on the seacoast east of Jerusalem, and abode in ships. When Assyria captured Israel, they struck out in their ships, and went to Ireland. David declared of Dan: "He breaketh (driveth) the ships of Tarshish with an East wind." Along the shore of the Mediterranean they left their trail in "Dens," "Dons," and "Din," and in the Peninsula of Spain, where their "waymark" name "Me-din-a Si-don-ia" remains to this day. Irish annals and history show that the first settlers of Ireland, at just this time, were the "Tuatha de Danaans," and this means, translated, "Tribe of Dan." In Ireland we find they left these "waymarks": "Dans-Laugh," "Dan-Sower," "Dun-dalke," "Dun-drum," "Don-egal Bay," "Don-egal City," "Dun-glow," "Lon-don-derry," "Din-gle," ""Duns-more," (meaning more Dans), etc., etc. The word "Dunn" in the Irish language means the same as "Dan" in the Hebrew, Judge. The other half of the tribe of Dan lived originally in the northern part of Palestine, and were taken with the rest of the Ten Tribes to Assyria, thence migrated north and west. As they went overland they left their trail, naming the "Dan-ube" River, also the "Don, the Dnieper," and the "Dnister." After leaving Assyria they inhabited the land west of the Black Sea, as we know from the names "Mac-don-ia," and the "Dar-dan-elles." In ancient and later geography we find also their trail by the names, "Dan-au," "the Dan-inn," the "Dan-aster," the"Dan-dari," the "Dan-ez," the "Dan," the "Don," the "U-Don," the "Eri-don," down to the "Danes," in "Dan-emerke," or "Dan's last resting place." The people of "Den-mark" are called "Danes," and "Scan-din-navians." "Denmark" means "Dan's Mark." When they came to the British Isles, we find the "Dans," "Dons," and "Duns" as prolific as in Ireland. There is "Dun-dee," "Dun-kirk," "Dun-bar," "Dun-raven," etc., in Scotland. "E-din-burgh" is the capitol. Even the capitol of the British Commonwealth is named "Lon-don." Thus the "serpents trail" of Dan, setting up "waymarks," leads directly to the British Isles! The ancient history and annals of Ireland reveal these facts: About, or prior to 700 B. C., a strong colony called the "Tuatha de Danaan" (Tribe of Dan) arrive in ships, drove out other tribes and settled there. Later, about 585 B.C., (the date of Jeremiah's commission), an elderly patriarch, sometimes referred to as a "saint," came to the most northern province of Ireland, Ulster. With him was and Eastern princess and a companion called "Simon Brack" spelled in the histories as "Breck," "Bareck," "Brach," "Berach," etc. The princess had a Hebrew name. "Tephi" — a pet name, her full name being "Tea-Tephi." This royal party brought with them some remarkable things, including the harp, an ark, and a wonderful stone called "Lia-fail," (stone of destiny). Every king in the history of Ireland, Scotland, and England has been coroneted over this stone. It rests, today, in Westminster Abbey, London, and the Coronation Chair is built over it. A sign beside it labels it "Jacob's Pillar-stone." (Genesis 28:18). The Hebrew princess was married to a young prince named Herremon, after which he became King Herremon. The son of this king and Hebrew princess continued on the throne of Ireland, and the same dynasty continued on through all Kings of Ireland, was overturned and moved to Scotland, continuing through the reigns of the Kings of ancient Scotland, was overturned again and moved to London, England, where the same dynasty continues today in the reign of King George of Great Britain! The present King George was crowned, in the coronation ceremony, broadcast to the entire world, as "KING OF ISRAEL." The crown worn by King Herremon and the sovereigns of ancient Ireland had TWELVE POINTS. In view of the linking together of prophecy and history, can anyone deny that this Hebrew princess Tea-Tephi was the daughter of Zedekiah of Judah, heir to the throne of David? That the aged patriarch was Jeremiah, and his companion was Jeremiah's scribe Baruch? And that King Herremon was a descendant of Zara, here married to daughter of Pharez, healing the ancient breach? That when the throne of David was first overturned by Jeremiah, it was PLANTED in Ireland, later overturned and planted in Scotland, again overturned and planted in London, from where it cannot be moved UNTIL THE COMING OF CHRIST? The present King George of the British Commonwealth possesses a chart showing his ancestry, every generation, back to Herremon and Tephi, to Zedekiah, on back to David, and through the Biblical account clear to Adam! DAVID'S THRONE STILL LIVES. When Christ comes to sit on that throne, He will take over a LIVING, not a nonexistent throne. God's Word stands! God has kept all His promises! 9. To whom was possession of the land given? Genesis 48:4. Then it is EPHRAIM who in 1917, as Gentile Times began to end, TOOK JERUSALEM. Since Britain then took and now holds Palestine, Britain must be Ephraim today. Memory Verse: Genesis 39:2 first part. 2. If they followed His civil statutes, and kept His commandments, did God promise to make them so wealthy and powerful they would dominate over all nations? Leviticus 26:3-13. 4. After Israel had been taken captive at Assyria, and Judah to Babylon, is it not also four times declared that "seven times" (2520 Years) shall pass over this Gentile world-dominion, started by Nebuchadnezzar's Kingdom? Daniel 4:16, 23, 25, 32. Is it not obvious, then, that the Birthright promised to be fulfilled in the tribes of Ephraim and Manasseh, could not be actually realized until after their 2520 years' national punishment for sins? Thus God punishes the people for their sins, yet keeps His promises to Abraham. The promises, then, must be fulfilled only AFTER this duration of punishment. The House of Israel (headed by Ephraim-Manasseh) went into national punishment 721 B.C. Therefore, they could not come into the great national Birthright blessings until the period beginning 2520 years later, or 1800 A.D.
5. Whose descendants were to grow into the promised "multitude," or "many nations?" Genesis 48:13, 16. Was Manasseh to become the GREAT NATION, and Ephraim the still greater "COMPANY OF NATIONS?" Verses 17-19. Since 1800 A.D., has the United States become the greatest single nation on earth, and the British Commonwealth of Nations a still greater COMPANY of nations, and the only such company of nations in world history? 6. Read again the prophetic promise of Genesis 22:17, and Genesis 24:60. Since the Birthright pertains to NATIONS, would not "gates of enemies" be such passes as the Panama Canal, Strait of Gibraltar, Suez Canal, etc.? It is a fact that since 1800 Great Britain and the U.S. have come to possess every such "gate" in the world. 7. When was the dying Jacob's prophecy regarding the tribes of Israel to take place? Genesis 49:1. What, today, was to be the national condition of JOSEPH — both tribes together — was to become fruitful in population, and a COLONIZING people, spreading out from the British Isles. Have the white English-speaking people fulfilled this? NOTE verse 23. Other nations hated them but they were to be made strong by Jacob's God, we were to conquer and withstand them. Has this happened? Notice the blessings of vast wealth and resources, verses 35-26. Do we possess them? Together, Britain and America own more than two-thirds of all the material wealth and resources of the world! This is WHY the Dictator powers attack us today! We are the HAVES, they the "Have NOTS." 8. Jacob's blessing upon Ephraim and Manasseh indicated their descendants would grow TOGETHER, later separating, after which Manasseh would become a GREAT nation, and Ephraim a commonwealth of nations. Now notice Isaiah 49. It is addressed (verse 1) to "Oh, Isles," and (Verse 3) "O Israel." Read verses 19 and 20. Assyria "swallowed them up." This, then, is after they are far away from Assyria. They are too crowded with inhabitants. They were to LOSE their first colony, (New England, becoming the U.S. — the separation of MANASSEH from EPHRAIM), AFTER which many other colonies were to be established. Has this not happened? NOTE: Some cannot understand how the U.S. can be Manasseh, when a large part of our people have come from many nations besides England. A large part of Manasseh remained with Ephraim, as explained above until they separated and became "New England." Were our forefathers to be sifted through many other nations? Amos 9:9. Notice this refers to ISRAEL, not the Jews. The answer is that many of Manasseh filtered into many nations, finally emigrating to the U.S., after the "New England" colony had separated from the brother Ephraim and become the U.S.A. Thus we are called the "melting pot" of the world. Undoubtedly a large portion of the foreign immigrants in this country are of the blood descents of Manasseh, regardless of their supposed nationality. God has seen to it and brought it about. 9. What was Moses' dying prophetic blessing for Joseph's descendants? Deuteronomy 33:1, 13-17. What nations fulfilled this prophecy today? The unicorn is the British national seal. Our people possess the world's agricultural, mineral, timber, oil wealth. We have the gold, silver, iron, steel, copper, tin, coal. We have the oil, the fruit, the corn, the wheat. And they fell into our possession after 1800 A.D.! Abraham Lincoln summed up this great fulfilled prophecy: "We find ourselves in the peaceful possession of the fairest portion of the earth, as regards fertility of soil, extent of territory, and salubrity of climate... We...find ourselves the legal inheritors of these fundamental blessings. We toiled not in the acquirement or the establishment of them." God simply GAVE them to us. He has KEPT HIS PROMISE TO ABRAHAM, and we, his multitudinous children, enjoy these material blessings today! If WE are not "lost" ISRAEL — Birthright ISRAEL — who else can be? Can there be any stronger PROOF of the divine inspiration of the Bible, than these mighty fulfilled promised, enjoyed by us today? 1. When God promised our forefathers vast prosperity and national dominance for obedience, and the "seven times" punishment for disobedience (which lasted until 1800 A.D. for our people), what two commandments were especially stressed? Leviticus 26:1-2. 2. Study Exodus 31:12-17. Here is a special covenant between God and Israel — our people. Is it called a "covenant," and how long was it to endure? Verse 16. A "SIGN" is a mark of identity. Merchants hang out signs in front of their stores, to tell WHOSE store it is, and what kind. Was the Sabbath made the SIGN by which our people were to KNOW, or identify God? Verse 13. HOW could the Sabbath identify God? Verse 17. (NOTE: Creation is the PROOF of God. Thus the seventh day is the only one that could point back as a memorial of Creation and God chose the very day for assembly and worship which would thus continually keep His people in the memory and true worship of the true God. No other day could serve this purpose.) The Sabbath also was the SIGN of Israel's "Sanctification." Verse 13. To "sanctify" is to "set apart." Thus this day was to set our people apart from other people as GOD'S people. Gentile nations never kept the Sabbath. Thus it was a SIGN by which they were to KNOW GOD, and also the SIGN that would IDENTIFY Israel as GOD'S people. Was it holy to God? Verse 15. How long was it to remain a SIGN? Verse 17. Has FOREVER ended? 3. We have seen in past lessons that Israel's initial and continuous sin, started by King Jeroboam's golden calves, was idolatry. We have seen that idolatry and Sabbath-breaking were the two sins our forefathers were especially warned against, lest they go into 2520 years' national punishment. Did they commit these two great sins? Ezekiel 20:10-13. 4. Did the Eternal patiently warn succeeding generations against following the ways of their fathers, instead of keeping HIS Sabbath? Ezekiel 20:18-20. Did these generations follow God's ways, or their fathers' traditions? Verse 21. 5. WHY did God finally, after many generations, drive our people out into their 2520 years' punishment which ended only in 1800 A.D.? Ezekiel 20:23-24. 6. Since they had refused to keep the covenant SIGN of their national identity, did God not give them over to their FALSE ways of men? Verses 25-26. Does God not give those who continually disobey Him and reject His truth over to believe a lie, instead of the truth? II Thessalonians 2:11-12. 7. We have seen that our people, Israel, lost their national identity as "The House of ISRAEL," and have come to be considered as Gentiles. Our people had a telltale SIGN, by which they should be KNOWN. Had they kept it, they never should have become the "LOST Ten Tribes." Judah, also went into national captivity because of Sabbath-breaking, (Jeremiah 17:19-27; 52:12-13). But, learning their lesson, these Jews who returned to Jerusalem 70 years later under Ezra and Nehemiah became such strict Sabbath-keepers they added some 65 rabbinical ordinances making the Sabbath a bond of servitude. It was these man-made ordinances Jesus broke and swept aside, saying "the Sabbath was made for man, not man for the Sabbath; therefore the Son of man is LORD also of the Sabbath." It is the day Jesus is LORD of; therefore it is the true LORD'S DAY. The Jew has strictly kept the Sabbath since — and has never lost his identity! Because of it, the Jew is mistaken for ISRAEL today. But our people Israel today as well as back in the 8th century B.C., follow the tradition of their fathers instead of keeping God's true Sabbath. What did Jesus teach about following tradition instead of God's Commandments? Mark 7:7, 9. 8. When our people finally are restored to Palestine, at the Second Coming of Christ, will they THEN remember these evil ways, including Sabbath-breaking, which caused them to be taken captive many centuries before? Ezekiel 20:43. Will they then keep the SIGN by which they shall KNOW the Eternal their God? Verses 42, 44. Will it take the Second Coming of Christ, when He comes to RULE over us, to bring our people to the truth? Verses 33-35. When Christ comes, what will happen to the rebels who refuse to keep His Sabbath? Verse 38. By a study of Verses 33-44 you will see that our people, in our present generation, will have turn back to the true Sabbath of God in order to be saved. Our people, Israel, today are in "Babylon," that paganized power that has deceived all nations (Revelation 17:2 and 18:3), but today God calls us who see the truth OUT of Babylon (Revelation 18:4), and unless we come out, and quickly, we shall suffer the SEVEN LAST PLAGUES! This lesson, we realize, has presented this subject from an entirely NEW ANGLE, which will raise up many questions. The author will be glad to answer all such honest questions. 1. After Israel's 2520 years' national punishment ended in 1800 A.D., our people have truly risen to all the national wealth and power promised to Abraham, and foretold for these latter days in the dying blessings of both Jacob and Moses. How strong were we to be in war? Jeremiah 51:19-20; Micah 5:8-9. Never has JUDAH fulfilled this prophecy, but ISRAEL has. 2. In this same day, WHEN we have been so strong, what does God say HE will do to us? Micah 5:10-11. 3. Study Jeremiah 30. Is the TIME of this prophecy the present LATTER DAYS, just before and during the time of restoration of Israel and Judah together, by the coming of Christ? Verses 1-3, 24. Is it referring to a time of peace, or a time of war? Verses 5-7. Are we to be saved out of this time of trouble? Verse 7. HOW? Verses 8-9. Notice, we are saved out of it only when God breaks a foreign YOKE from off our neck, bursts the bonds that shall be binding us. We shall be serving foreigners. 4. When Israel and Judah are again gathered back to Palestine, will ISRAEL (Britain and American) come from a condition of prosperity and world power, or from the land of our CAPTIVITY? Verses 10-11. Is there any cure for the military bruise inflicted in this time of our trouble? Verse 12. Will Britain and America have any allies in this last war? Verses 13-14. ("All thy lovers" is translated as "All your allies" in other translations.) How has God wounded us, cut off our cities (bombing), thrown down all our strongholds and fortifications? Verse 14. Could Hitler be the "CRUEL ONE"? Why is God sending this invasion and captivity upon Britain and America? Last part, Verse 14, 15. What shall be the final end of those who devour and take our people captive? Verse 16. Does this verse not show our people first must go into captivity? 5. Where is this warning prophecy to be shouted in these last days? Jeremiah 31:7-10. Has not Britain been the chief of the nations, in the Isles? When we are rescued and delivered from captivity by Christ's coming, shall it not be from a stronger enemy? Verse 11. 6. Was Britain and America to be PREPARED, or was it the GENTILES, Germany, Italy, Russia, Japan, etc., who were to be PREPARED for war at this time? Joel 3:1, 9-11. Has it happened this way? 7. In the previous lesson we saw that the two outstanding sins for which our forefathers went into punishment lasting till 1800 A.D., were idolatry and Sabbath-breaking. We know our people do NOT observe God's Sabbath today, but rather have been taught through the generations to sneer at it as the "Jewish Sabbath." Aside from idols in the Catholic churches, are there any idols in our land today? Isaiah 2:5-8. God has blessed us with greater wealth than any people ever had. But our people set their hearts upon this wealth, and the material things made by men's hands — fine clothes, beautiful homes, automobiles, etc., etc., instead of following God. Thus we have turned God's richest material blessing into a CURSE and a national SIN. God punished our people 2600 years ago for it — now we shall be invaded and conquered for it once again! 8. At the time when Israel and Judah together, weeping in true repentance, shall be restored by the coming of Christ, what does God say had caused our people to go astray? Jeremiah 50:4-6. In this latter day, have our people been willing to hear God's LAW? Isaiah 30:8-10. (NOTE: The margin for "the time to come" is the LATTER DAY — today!) In order to get a salary and feed themselves, have our preachers been willing to preach the soft and smooth things the people have demanded? Ezekiel 34:1-4. The preachers say "the LAW is done away." What shall happen to them? Verse 10. Will Christ our Lord have to come again, and restore our people to the true faith once delivered? Verses 11-14. 9. How many nations are today DECEIVED by the false teaching emanating from Rome? Revelation 17:2, 18:3. "Babylon" is the entire pagan Roman system fostered by the Roman church. Does the Roman church have any DAUGHTER churches? Revelation 17:5. By what name are they here called? It must be remembered that "Protestantism" has never protested about Rome's changing and doing away with God's Law (Daniel 7:25), but rather teaches that the Law is done away, rejects God's holy Sabbath for the original pagan day of SUN worship called SUN-day, and also retains many fundamental pagan teachings diametrically contrary to the Bible. Truly Israel is IN BABYLON today. In religion, in business, in society, we are in the ways and teachings of "Babylon." Is God calling us OUT? Revelation 18:4; Isaiah 48:20. Should we have been keeping God's Commandments? Isaiah 48:17-18. Were they done away? Psalm 111:7-8; Matthew 5:17-19. What is our Passport to the City and everlasting life? Revelation 22:14; Matthew 19:16-17. 10. After our people originally were scattered, and have served other gods and the work of men's hands all these years, what are we to do if we would find deliverance during the coming Tribulation in this latter day? Deuteronomy 4:27-31. If we forsake OUR ways and turn back to God and His Commandments through Jesus Christ, shall any plague come near us? Psalm 91:1-2, 7-10. 11. We now know our people are ISRAEL. We now know we are to be invaded and conquered by the sword God shall send because of our sins. When we see this sword coming upon our land, what are we commanded to do? Ezekiel 33:1-6. Every man and woman cannot preach or shout the warning. So far as we know NO ONE today is shouting this warning but the RADIO CHURCH OF GOD, and THE PLAIN TRUTH MAGAZINE. When you send regularly your tithe, and sacrifice to send the largest possible offerings, to add more and more radio stations, to publish additional thousands of copies of the PLAIN TRUTH, you are shouting this warning, and acquitting yourself before God. Are we showing as much zeal, making as much sacrifice to this end, as others are to fight on the battlefields and to contribute money for the defense of a doomed material kingdom? Christ is soon coming, to call each of us to account. Soon our money will be of no use, once we are invaded and conquered. But NOW, we can obey God and proclaim His warning to the millions of our people, before it is too late. But we must HURRY! Time is short.